Supply your restaurant, hotel, grocery store or building tenants with fresh, organically-grown produce harvested from just feet above on your rooftop. 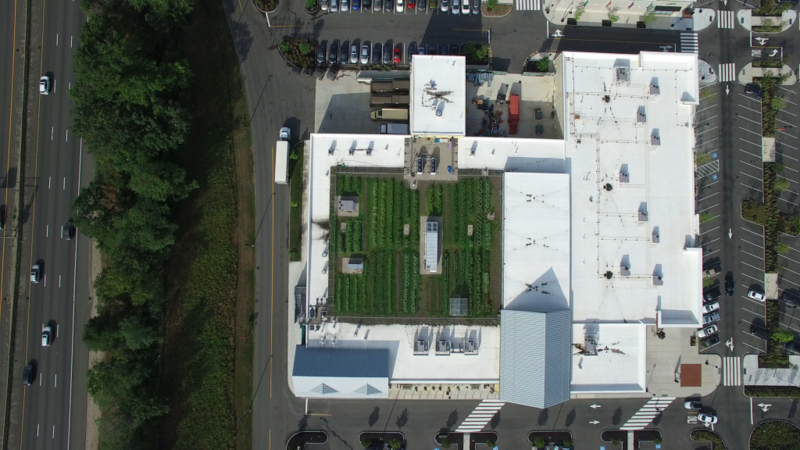 We install and maintain rooftop farms throughout the northeast, helping clients to serve hyper-local fruits and vegetables while generating buzz-worthy press and educating guests and tenants about urban agriculture. 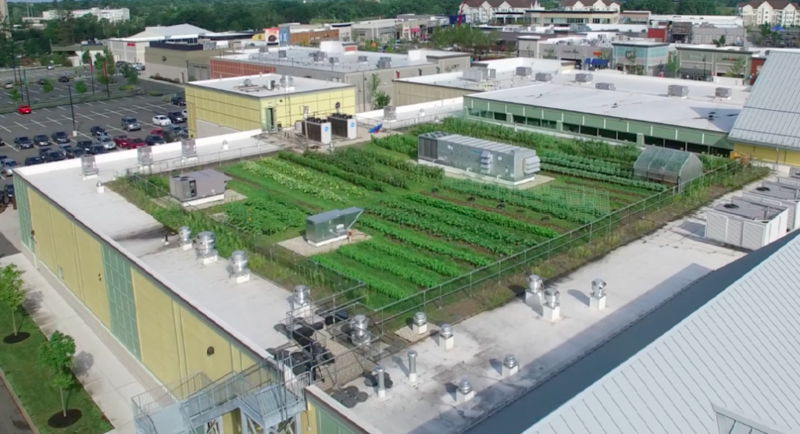 Rooftops offer ample, otherwise unused open space ideal for growing vegetables, making rooftop farming an attractive solution to feed growing urban populations in the future. 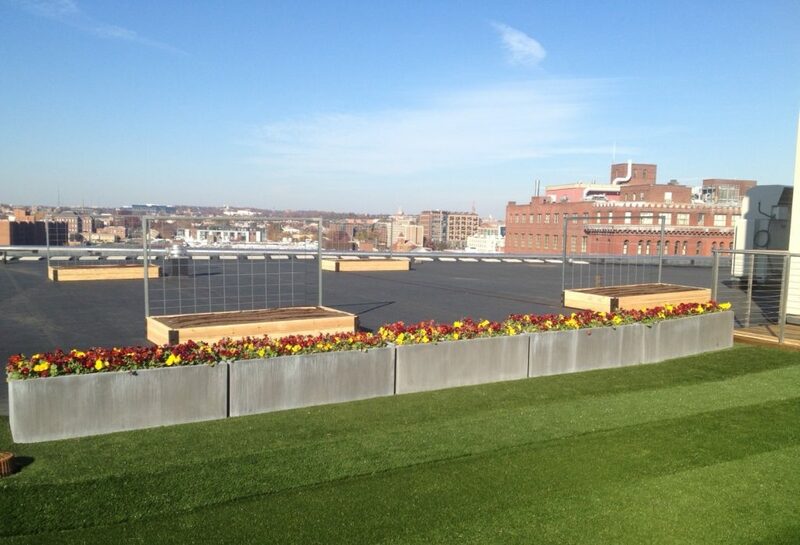 GCG partners with local green roofing and engineering companies, like Recover Green Roofs in Somerville MA, for the installation of all rooftop projects. System components are loose-laid on top of a membrane, through a process that makes no protrusions and ensures the integrity of your roof’s waterproofing. Depending on design preference, the system consists of mounds or containers of a custom blend rooftop soil mix engineered for successful growing. IS YOUR ROOF SUITABLE FOR GROWING? Are there any buildings or trees blocking available sun? 6 1/2 hrs of sun exposure or more is ideal for successful production, though there are many low-light crops that can grow with 4 1/2 hrs. Garden beds laid out in 12”-deep mounded rows between 30-55 lbs/sq.ft., while containers can range from 40-75 lbs/sq.ft. 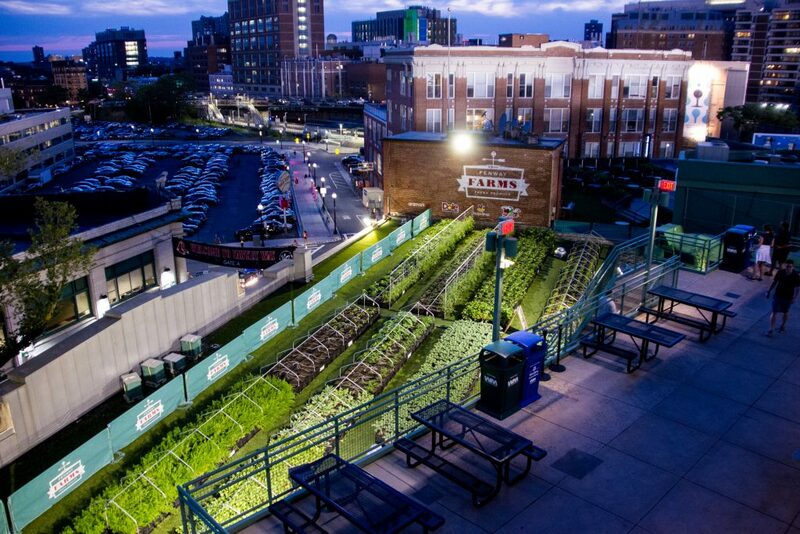 Upper levels of parking garages make ideal rooftop farms for this reason. Consult a structural engineer to confirm your building has the load capacity necessary for a rooftop garden. Is there a water source nearby, such as an outdoor spigot, to set up drip irrigation lines? If not, it may be possible to find a way to easily move water from the establishment to the garden site. Consider the access points to the roof. Moving soil and horticultural materials during installation and weekly maintenance visits from a farmer can be prohibitive if the only point of access is a ladder, but not impossible. In order to bring tour or educational groups to your site, the roof access point must be ADA-compliant. GCG can predict crop yields and analyze the market value of produce grown. 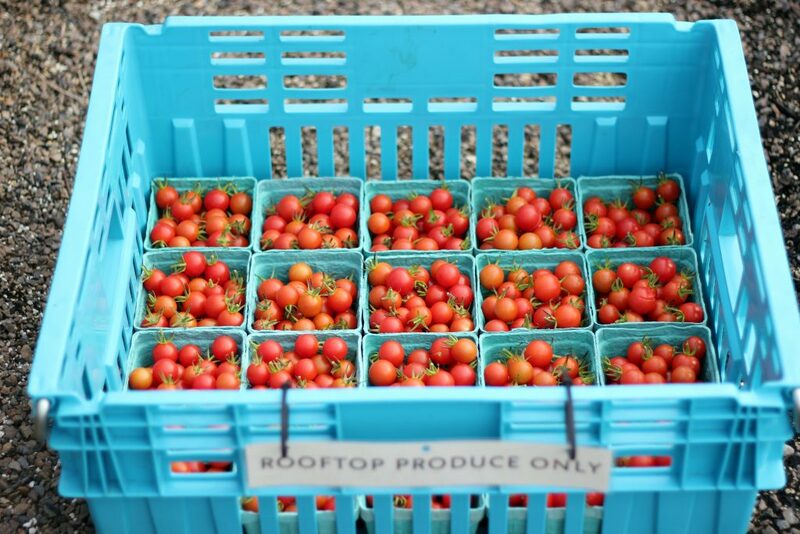 On average, a GCG-managed site yields 2-3lbs of produce per sq.ft. of growing space over the course of the season. Once plant selection is decided, GCG creates an intensive planting plan, including the yield projections and expected harvest dates for all vegetables and herbs planted. 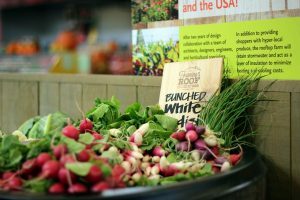 Produce grown can be merchandised, used in on-site dining services, donated, or given back to participants. Associated value analysis upon request. GCG offers a wide variety of crops to grow in your garden. We recommend narrowing your choices to a few select crops that you can then source solely from your garden in place of your suppliers, including heirloom varieties not readily available. Herbs are often the best option for restaurants with limited space, as you can grow the volume that the restaurant uses and receive the greatest return on investment. We harvest and replant over the course of the growing season to guarantee maximum yield. All of our sites are custom-tailored to your vision. We can help you with a comprehensive marketing strategy geared to meet your goal. The more your clientele is aware that produce is grown on site, the happier they will be. Large high-quality prints hung inside your establishment, menu description or signage, asterisks to denote menu items grown on site, menu board listing items harvested for the chef that day, daily social media updates, a designated web page and regular press releases are just some of the ways that we can help you to promote the project. Recover Green Roofs, a Somerville-based green roofing company, provides the physical foundations for our Green Roof farms using a custom Vegetable Green Roof system. Components are loose-laid on top of membrane, making no protrusions, ensuring the integrity of the water proofing. 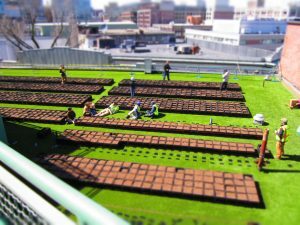 The system consists of mounds of rooftop soil mix, engineered for growing success, which Green City Growers then plants and maintains. 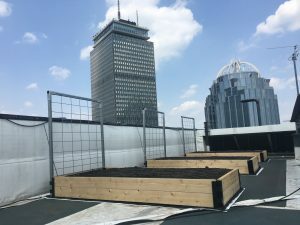 Fenway Farms at Fenway Park and New England’s largest rooftop farm at Whole Foods Market in Lynnfield, are examples of the projects GCG and RGR have collaborated on. 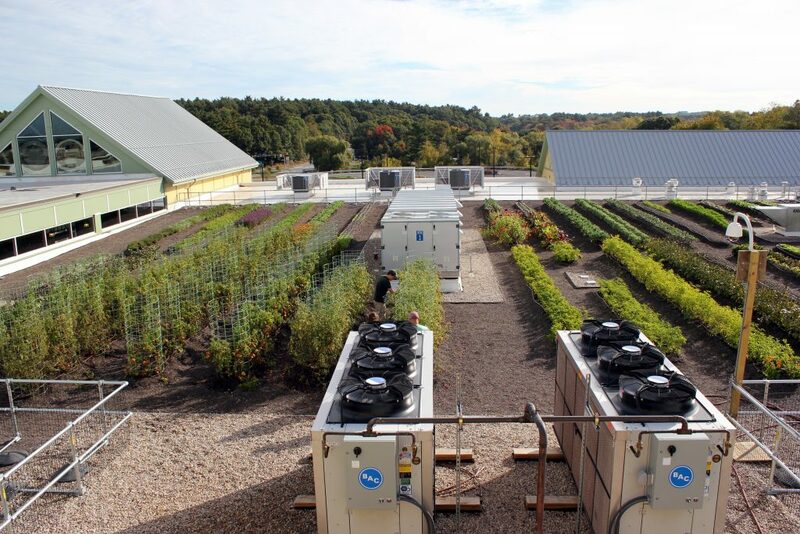 The video below details how GCG and RGR work in harmony with Green Roof farm clients.